For many runners, experiencing pain above your heel when you stretch your ankle may not seem that serious. You may assume it is an ankle sprain and nothing more. The bad news is that a condition called an Achilles tendon rupture is often misdiagnosed as an ankle sprain. This misdiagnosis happens up to 25% of the time. The good news is you can perform an Achilles tendon rupture test to help you get the proper diagnosis. A condition called insertional Achilles tendinitis may also cause similar symptoms. This condition can be treated by Achilles tendon massage which helps break down scar tissue. Wearing the best shoes for Achilles tendinitis is another good solution. 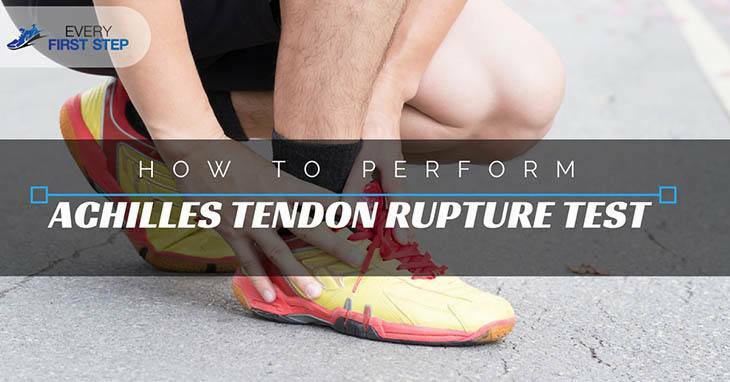 Merely examining the area based on appearance, feel and movement is not a reliable way to diagnose a rupture because it is not conclusive can be easily mistaken for an ankle sprain. Some who have a ruptured tendon can still walk, others can still move their ankles up and down and many may not have a very high tenderness level, performing an Achilles tendon test is the best option. This test was developed by Franklin Simmonds and later by Thomson and is considered the principal clinical test for the rupture of the Achilles tendon. This test is composed of three tests namely, the calf squeeze test, the ankle declination test and the Gap test. This is also known as Thomson’s test and is performed to determine whether the Achilles tendon is completely ruptured based on the reaction of the foot when the calf muscle is squeezed. Have a friend squeeze the calf of the uninjured foot with both hands. Normally, the squeezing of the calf muscles will result in a flexing of the foot. Next, have them squeeze the calf muscles of the injured foot with both hands. This test can determine whether the Achilles tendon is ruptured based on the altered angle of dangling or altered angle of declination. When the Achilles tendon is ruptured, during an examination, a gap located at the back the foot above the ankle can be felt. Although this test is the least sensitive, it is still a good way to diagnose an Achilles tendon rupture. You don’t have to be among the many who misdiagnose their condition. Perform these three tests and you will never go wrong. Of course, prevention is always better than cure and strengthening your Achilles tendon is one way to do that. Make sure you include stretches such as the heel cord stretch. The clinical diagnosis of subcutaneous tear of the Achilles tendon.